Mobile Bingo Bonuses bring you a fun and friendly online gaming site called Bucky Bingo which has over 30 years’ experience with some amazing promotions and games. They offer both bingo and slot games including some household names such as Britain’s Got Talent and The X Factor. 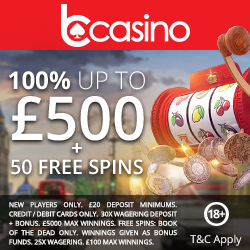 When you register with Bucky Bingo and make your 1st deposit you’ll receive a whopping 300% cash match bonus on a minimum spend of £10. This means that if you add the £10 minimum, they will give you an extra £30 totalling £40 to play with. This credit will give you a great opportunity to try out the site and their great choice of games before spending any more of your own money. They even offer complimentary bingo every day between 11 to 11.30am and 11 to 11.30pm, where you can still win anything up to £1,000 and its cost you nothing! Bucky Bonus – When you deposit with Bucky Bingo you’ll receive a special bonus in the first week of the following month. For any deposits up to £250 they will credit your account with cash, so the more you deposit the more you’ll receive! £20k Bingo – On the first Saturday of every month you could win a share of £20,000 with Bucky Bingo. You can access the Big Money Room between 10 and 11pm and play for 10 chances to win £1,000. Then at 10.30pm there’s the opportunity to scoop the big one, a whopping £10,000, and with tickets only costing 50p that would be a great prize! Bucky Super Sunday – When you spend £10 or more on bingo tickets on a Sunday, they will add £5 to your account as a little bonus. 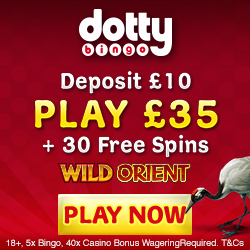 Dynamite Friday – Spend £50 or more on bingo tickets on a Friday and you’ll receive £5 credit. If you’re a social butterfly then make sure you check out their Facebook page to keep up to date on the latest games and promotions. As a Facebook ‘liker’ you’ll be able to access exclusive competitions on a regular basis where you could win amazing prizes and additional bonus credit. You can contact a Bucky Bingo representative via live chat, email, telephone or post. They are available between 8am and midnight, 7 days a week. They accept the usual banking methods including Credit and Debit Cards, Paypal and Paysafe Card. 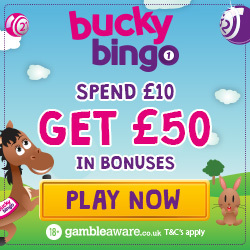 So if you’re ready to claim the 1st deposit bonus then simply head to Bucky Bingo.